Salah dropping at -1.5%. That’s some -4s there, trying to accomodate Aguero I believe. Madness. It’s always like that. There’s an elite side to this game we can only dream about. People would be bringing in Kamara, believe me. Some managers out there have brought in Mawson this week. Seriously. 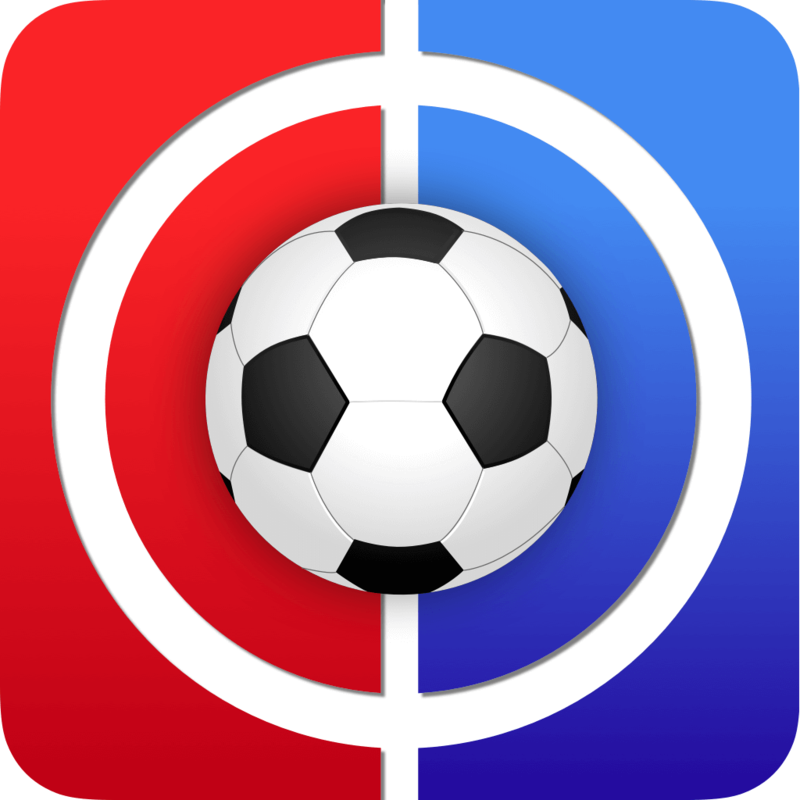 There are leagues where the worst team value wins, where the lowest scorer is the daddy. I’d love to find the forums where managers in those leagues discuss their tactics. There are ecstasies beyond our imagination. Some managers celebrate triple-captaining a player who misses a penalty and then gets sent off. That’s the admin team constantine, not the FF247 team. And yeah, it’s the same this year as the team is only there for Elle to control things. I know all this because I’m absolutely hammering said team this week! That’s the ‘dead’ team we put in every H2H league in order to admin / run each one. That’s not the official Site Team, you tool! We post a full article about the Site Team each week constant, not quite sure how you missed it. DMC/Initt. Of course I know about the site team guys. Been old enough on this site to have known that. Guys I really need help cos am about to smash my phone ffs. This is cruel. Still have all my chips, I have fallen to 2nd in two of my very important leagues. Don’t know about ye but this hurts. 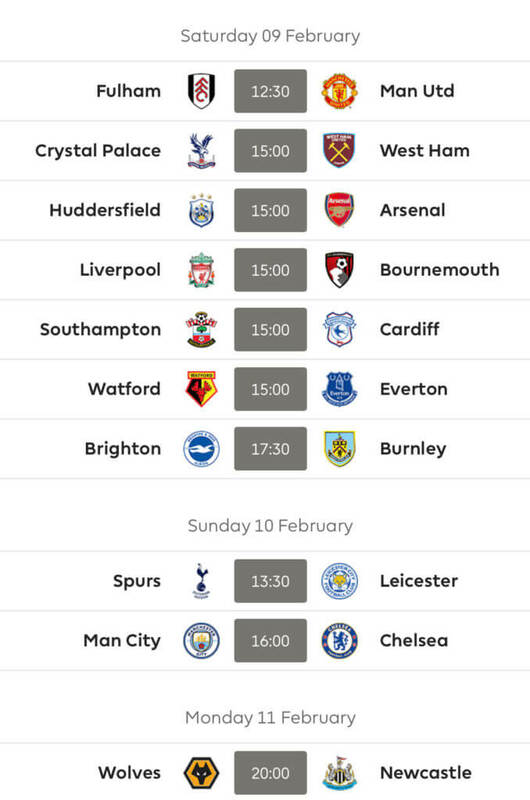 I’d just turn off everything related to fantasy football, allow cup games to happen and tune back in next Wednesday say when the dust has settled. Just go for a walk / watch a film / have a few treats. Yep all that….then ditch Hazard and Sane….!! Lads at work will laugh at me, I had so much clout being on top. Just pretend it’s part of some masterplan. There’s plenty of time to barricade yourself into a padded soundproof cell and indulge in some primal screaming get the points back. You have 5 non-playing players for next week. I think you can do Sane to Mane and play 4-3-2 with 10 players. Don’t think you need to take hits just to bring someone who plays next week. 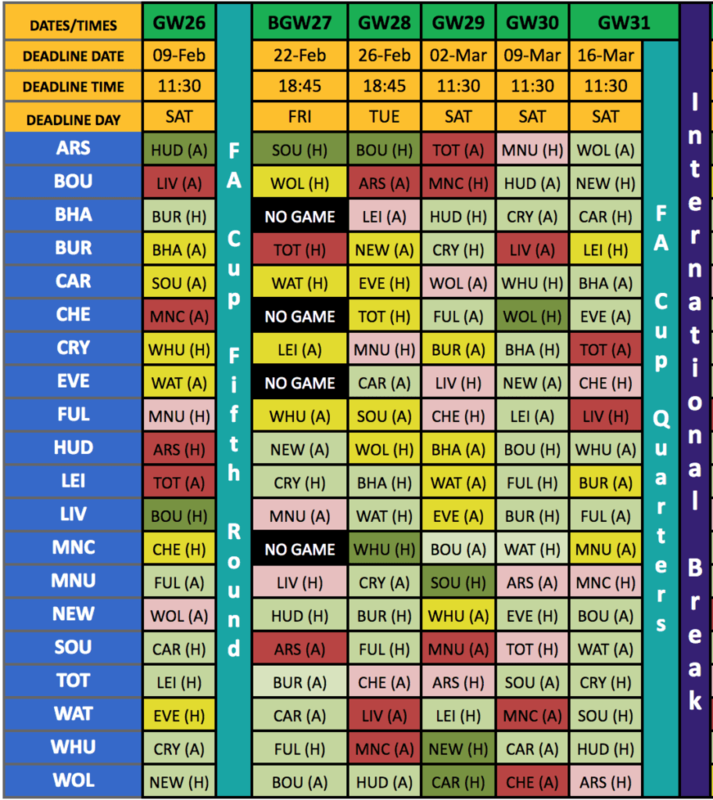 The fixtures are not that easy. Would it be unwise to use free hit next gw ? No. I’d save it for the DGW. Why do you want to give your lads a chance to outscore you when they play their chips during DGWs? When you say second in the leagues, by how many points? My team is falling apart! I was leading a ml by nearly 100 points and not having Aguero and Laporte has now put me in second! Sane and Danilo need to go! Worth waiting or should I move early? Will probably want Aguero in a couple of weeks! Thoughts? I would wait till after the FA Cup and CL games, could affect a lot with preparations for GW31 onwards. Obvious moves would be Sane -> FAnderson and/or Danilo -> Pereira/Maguire/Chilwell. If Wolves lose their FA Cup game, Kolasinac is also an option. Haven’t really got a plan as yet! I still have WC, BB, TC, and FH! Worried that waiting will mean I can’t afford someone but then moving early will mean they get injured! Just be ultra-chilled. Looks like you may even be able to roll the transfer. You have Auba. Start having a think about the blanks, the doubles. Thanks Kralin! I think I need to do something as I don’t want to be left short again! I ended up with 9 players this week thanks to no Auba, Rashford, Sane, Danilo and Brooks! With Sane and Danilo missing next gw, it only gives me 1 player on my bench if I try and roll the transfer! Trying to decide what order will be best for using the chips but that will depend on who is playing and who isn’t! After today’s shambles, I can’t see Chelsea getting past United next weekend in the FA Cup. 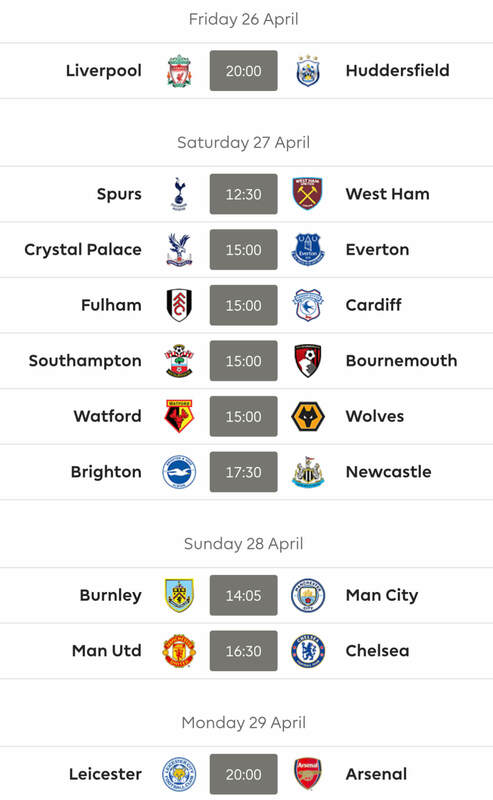 This would mean Everton would not blank in GW31 or GW33. This guy is 3rd in one of my leagues. Team was dead for 10 weeks, didn’t use his first wildcard. Ranked 167k overall. Funny how this game works. Was thinking either sane to mane, ( but game v utd’s isn’t ideal) or sane to Anderson and use the £ elsewhere player on. I’d be very surprised if Auba wasn’t the most captained player next GW, so I’d prioritise getting him in. Just hang on and hope his price falls. Thanks Kralin, but need to ditch sane before his price drops, so more worried about a replacement for him first off. Early transfers before the next GW are not for the faint-hearted. There’s a lot of cup action before then. I’m slightly tremulous and I have 2FT. A couple of injuries will leave me sad and blinking a lot. It’s all deeply contextual. I’m keeping a close eye on OR. In terms of my ML it’s fairly irrelevant. I’m worried at the moment about not owning Auba, whose next two fixtures are very good – on paper. But yes, Sane would be a worry to me. So in that case, & going back to my original question. Ampersands always give me the fear. Onus is on you, buddy. I’d do some legwork in your shoes. I could flip a coin and give you a quick answer but there’s no fun in that for either of us. Maybe reason out who you actually want and bring that evidence back to the jury. If I have to don the black cap I will, I promise. Would you sell Kun for Auba, knowing City host West Ham in GW28? Yes. It may be a case of in one door one moment, out the next. Of course, seems perfectly logical to do so and then swap back. Interesting, 2/2 yes’s. My doubt is that this would take up all free transfers over and after a BGW and in front (ish) of another BGW. The argument for is of course to own the perceived best Capo choice for BGW27. I’m on that Hazardous camp too, with no Auba and no clear path to get him. Sonny is wearing the armband atm. Could well be Salah though. Hazard should be sold, but it should be for Sterling (especially if no Aguero), but that doesn’t make sense ahead of 27.